Look at those blue and black stripes! And the slanted name! I don’t care that I’ve never heard of Tom Runnells, these cards were fancy and futuristic! Am I the only one that felt this way? I remember going to a baseball card and comic book show somewhere in Ohio, maybe Dayton or Columbus, with a friend in 1986. It was a long car ride, and I didn’t have a whole lot of money to spend. I spied a 1986 Donruss Dwight Gooden card, and the dealer priced it at $3 if memory serves. $3 for a non-rookie card. Nothing released by Topps approached that! You could get Topps packs at the convenience store or gas station, but Donruss? Not a chance! 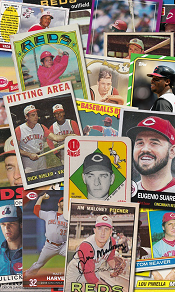 Packs were more expensive, and singles were more expensive, because they were not as readily available as Topps. I didn’t buy the Gooden card. I have no clue what I did end up buying on that trip, if anything. It was a long time before I acquired many 1984-1986 Donruss cards. I now own most of them, missing only a handful from 1984 (Dave Concepcion Diamond King and the Johnny Bench/Carl Yastrzemski special) and 1986 (Ted Power and Max Venable). They still look futuristic compared to their contemporaries. Of course, the price has dropped considerably on most of those cards, and with the internet, they are easy to obtain on the cheap. Still there is something about them that is timeless. Topps and Fleer released update sets at the end of the year to showcase veterans that changed teams and rookies. Donruss didn’t care about traded players, but they certainly cared about rookies. Young up-and-coming players who were sure-fire future Hall of Famers like Jose Canseco and Bo Jackson were a hot commodity and Donruss needed to cash in! 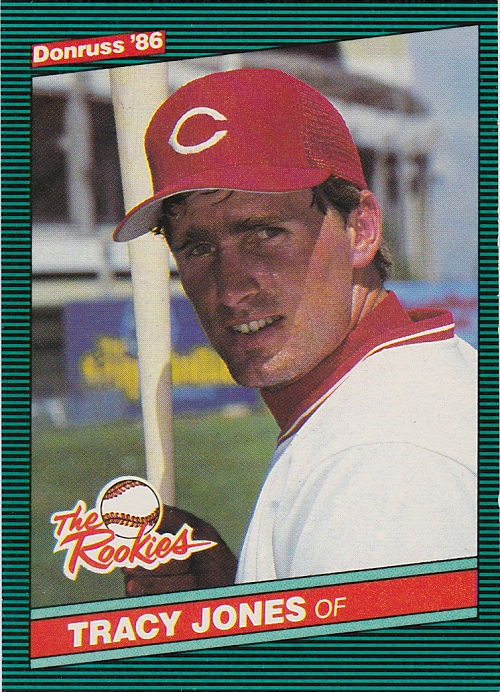 There was only one Cincinnati player featured in the green-and-black striped 1986 Donruss Rookies set, and it wasn’t Barry Larkin. Tracy Jones was the can’t-miss rookie in the Queen City. But boy, did he ever miss. Donruss also released a set called “Highlights” featuring gold and black stripes. Monthly award winners, Hall of Fame selections, MVPs, Rookies of the Year, and Cy Young pitchers were all included, as well as record breakers and other newsworthy events. Bill Gullickson, Ernie Lombardi, and Eric Davis all scored cards in the Highlights set. This set seems to have been produced in greater quantities and can often be found for a buck or two. Finally, we have the Donruss version of O-Pee-Chee. Leaf cards were the Canadian version of Donruss and were produced from 1985 through 1988 with a smaller checklist. 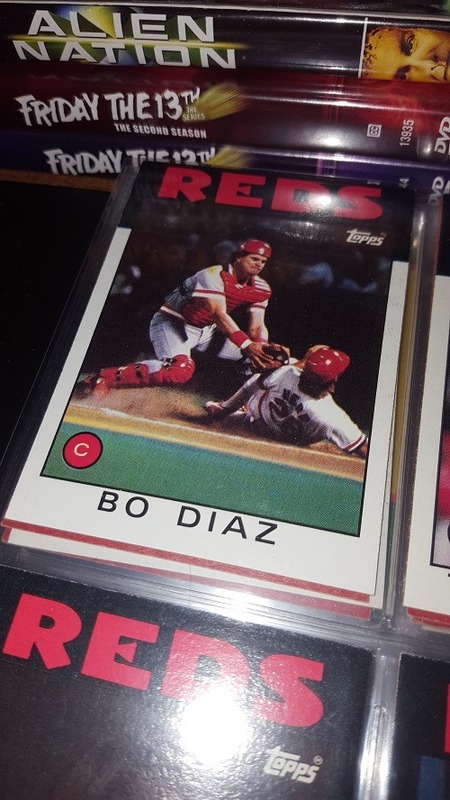 Reds catcher Bo Diaz is one of only eight “regular” Reds cards that made it into the Leaf set. Donruss also released a set of supersized All-Star cards in 1986 that were as big as two regular cards placed side-by-side. According to my wantlist, I have the Pete Rose card but I’m missing Dave Parker. I think I do have Parker also, but those cards are still in a shoebox somewhere and I’m not supposed to bend over right now because I’m still recovering from back surgery I had in September. Happy Reds birthday, Bo Diaz! What does the rulebook say? When the catcher drops a third strike, the batter can attempt to reach first base before the ball is thrown to the fielder. But what if the batter incidentally kicks the ball out of the catcher’s reach and beats the throw? This happened during a game in Cincinnati between the Reds and Mets in 1987. With Howard Johnson at the plate, Bo Diaz dropped a third strike. The ball rolled to Johnson’s feet, and when he realized what was going on HoJo took off running. As he did, the ball shot out into the infield, where pitcher Ron Robinson picked it up and attempted to throw him out. But the ball hit Johnson before it reached Tony Perez, and Johnson was ruled safe. As you can see in the video, Pete Rose, Ron Oester, Dave Parker, and several other Reds players argued the call. But the umpire’s ruling was final, and HoJo remained at first. Will instant replay end these types of on-field “discussions” between managers and umpires? Cincinnati hasn’t seen a manager argue with the umpire much in recent years, as Dusty Baker preferred to gnaw on his toothpicks. But even with a potentially more aggressive manager in the dugout, will these interactions be a thing of the past? Bo Diaz was a teammate of Pete Rose‘s in Philadelphia in ’82 and ’83. 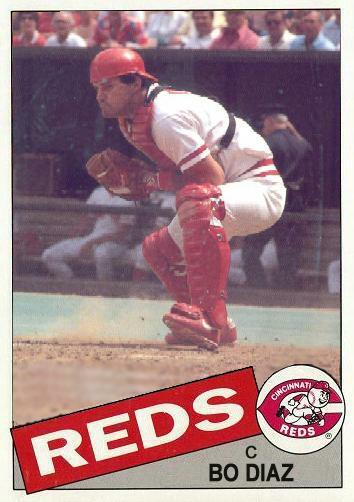 I wonder if Charlie Hustle pulled some strings to bring the catcher to Cincinnati? 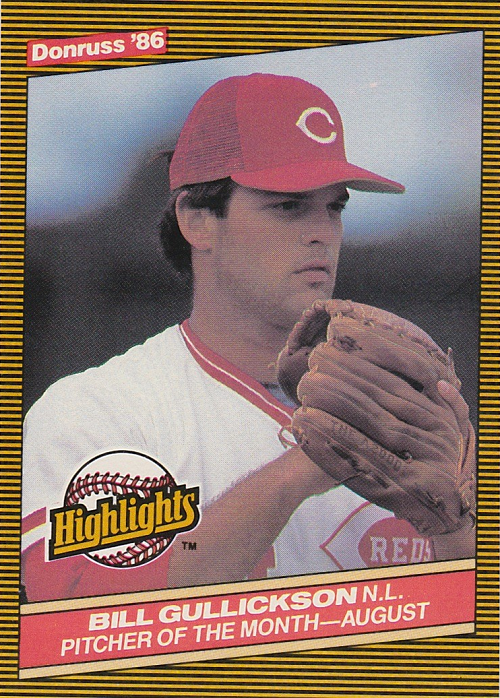 He had been an All-Star for Cleveland in 1981 and would make the squad again while with the Reds in 1987. 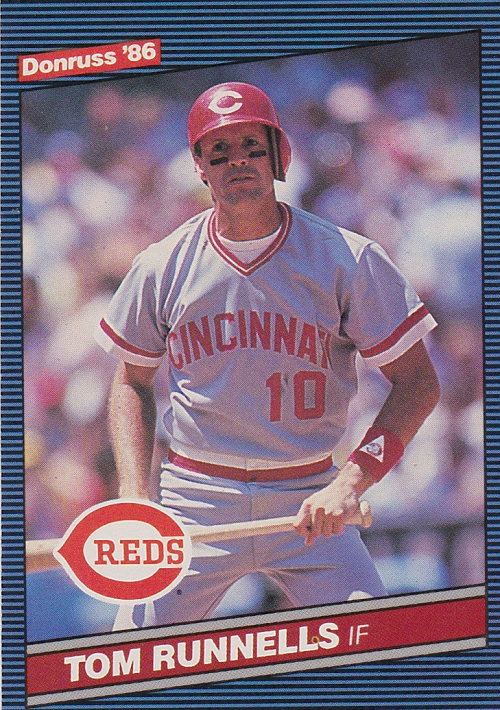 It’s ironic that one of the guys traded for Diaz in 1985 was Alan Knicely, who was one of only two players pictured in a Reds uniform in the actual 1985 Topps Traded set. Diaz passed away in November, 1990, while adjusted a satellite dish on his roof. He was only 37 years old. There was one slight problem with the order concerning a 1990 Ken Griffey Jr. card, listed as O-Pee-Chee but it was actually Topps. According to Wikipedia, “In 1990 O-Pee-Chee printed a set virtually identical to the 792 card Topps set complete with the Topps logo. The only differences between the two are the bilingual reverse sides and the copyright line.” The card I received was clearly the Topps version, so I contacted the seller. Within seconds, he responded stating my money ($1.26) had been refunded for that purchase and to keep the card. That’s a great seller. He has a bunch of other stuff listed right now, so go check out his shop and buy some stuff from him. 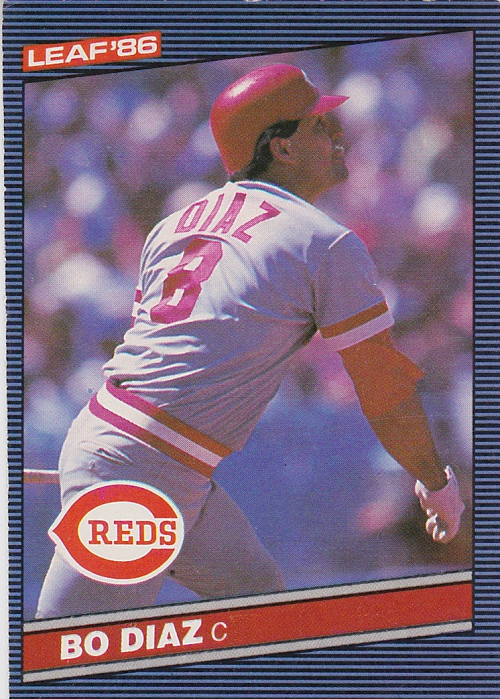 Bo Diaz was a 1987 All-Star for the Reds, and was solid behind the plate when healthy. He was tragically killed in 1990 while installing a satellite dish in Venezuela at the age of 37. …is that they don’t mind sending me Reds cards! Dayf pulled a few Reds in 2010 packs and sent them and other Reds cards on to me in a very non-Bip fashion (which I appreciate, although I wouldn’t complain if I got some of Bip’s Reds cards). The Topps design has really grown on me, while Upper Deck just gets uglier every time I look at it. And these playing cards are awesome. I’ve seen a few, but this is the first time I saw I saw the Nasty Boys Wild Card. Very appropriate. And Dayf knows that Bo knows Reds fans. No, not Bo Jackson…Bo Diaz!